The Wharf is the ONLY place in my area that carries Liga Privada cigars other than the Undercrown. On Thursday morning they unearthed some surprises in a Drew Estate shipment. The Feral Flying Pig, the Dirty Rat, and the T52. 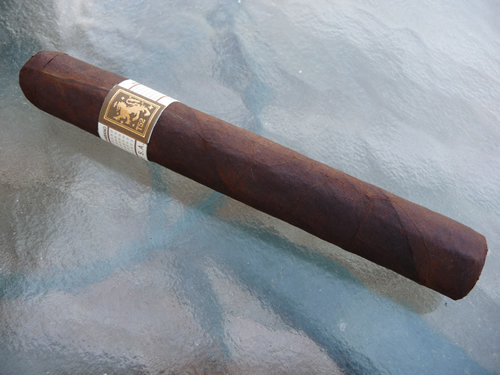 Now, I know that the Feral Flying Pig is one of - if not THE - most sought after cigar today. After much geeking out about them receiving these new additions, I broke down and bought one. I even got to open the box and undo the ribbon....that's right, I was the first T52 purchase in the Dayton area...in history. I know....that may be worthless history, but still pretty cool. Let's see how it smokes, shall we? Construction: This is a beautiful cigar. Simply beautiful. The wrapper is a sun-grown habano that is stalk cut. This is a pretty neat thing wherein the entire leaf and part of the stalk it is attached to are cut and hung for curing. The leaf color is a beautiful mottled brown and red with some beautiful gold around the edges of the veins. The T52 is pretty hefty in hand as well and the band is a gorgeous orange and gold variation of the No.9's blue and black. Pre-light Aroma and Draw: While not packed in cellophane, the T52 gives off aromas of cedar, leather, an undefinable woody sweetness, and mild spice. A cold pull gives cocoa and a creamy sweetness that reminds me of Devonshire cream. Light and Burn: Lighting is a snap with a couple of matches. Burn produces a nice solid pale gray ash with a nice crisp burn line. The T52 is a smoke bomb too - loads of white smoke billowing from the cigar with every puff. I did find a couple of wrapper tears along the edges of the outer leaf as I smoked but they really didn't amount to anything more than minor packaging damage. Tasting: Starting off the T52 is not as potent as the No. 9. The start is cool and soft with a nice woody character laced with some coffee beans. I am getting a very unusual flavor set in the first third. Earth and leather being the predominant flavors, I am getting caramel, coffee, notes of dried fruit, and some very elegant orange blossom floral notes. The blend of this cigar is terrific and well balanced. I am going to call the strength somewhere at the top end of medium so far. I find the blend of this cigar to be a completely different experience than the rather " in your face" power of the 9. The second third starts off with more floral sweetness that leaves a terrific aftertaste in the mouth - how often do we cigar smokers say that?!? The flavors are a bit more toasty in this part of the cigar. I get some roasted almond flavors with the orange blossom, leather, dried fruit, and coffee from the first third. The flavors are terrifically rich and deep. Strength kicks up more towards the medium-full area here too. The final third is here - which is a sad thing. I am getting a terrific amalgam of flavors. Coffee, cocoa, leather, vanilla, and a touch of cinnamon. Some of those floral fruity notes still linger in the background. There are some dense roasted nut flavors in there as well. Simply awesome. As I smoke this amazing cigar down to the nub, I get some vanilla and dark chocolate notes on top of the already crazy complex blend of flavors. Value: This ain't no cheap cigar, my friends. At around $14 and change, this is a celebration or special occasion cigar. I would line a section of the humidor with them if I could. Still, for such an amazing cigar, that is not a bad price. 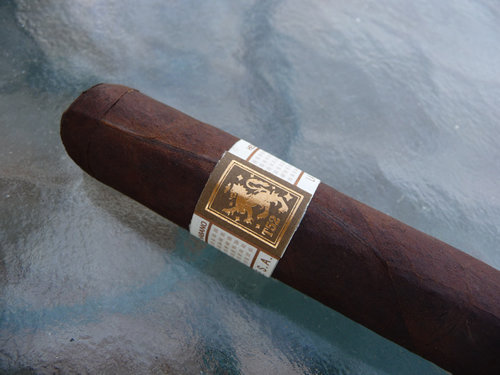 Final Thoughts: The T52 ranks as one of the best cigars I have ever smoked. It is highly unique, expertly blended, painstakingly constructed, and just decadent from start to finish. There are only three cigars I have had this year that are equally as memorable and efficacious. I knew this was bound to be a good cigar but what I ended up with is a cigar for the ages. Hands down, the T52 is highly recommended to anyone that likes fine cigars. Love the band - love it! Just finished smoking one of these masterpieces based on a strong rec from Mr. Poe. Absolutely fantastic smoke all the way through. Definitely one of my top 5 cigars EVER! Superb roll, wonderful tastes, enjoyable throughout. I found it to be medium to strong overall. I look forward to smoking another one very soon.